The RT-N12 D1 Wireless-N300 router delivers reliable and fast speeds on both wired and wireless network connections for your home or office environment. With 2T2R MIMO technology and two detachable 5dBi high-gain antennas, the RT-N12 uses the latest antenna innovation for extended wireless coverage range, making it ideal for streaming HD video, placing VoIP calls, and other essential Internet tasks. 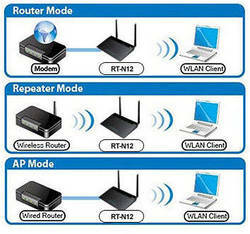 The RT-N12 specializes in delivering exceptional signal range for speed and reliability on the wireless network. Advanced High Power technology from ASUS enhances signal strength for almost double the range of other routers. Setup and customize up to four wireless networking accounts. Privacy control for each user account restricts access to specified Web sites, and lets you set a limit for the maximum amount of bandwidth each account can use. With the RT-N12, setup is a breeze. Simply power and connect the router and open a browser on a Wi-Fi-enabled device like a notebook or pad. You will then be taken to a setup page with a prompt to enter the ID/password from your internet provider, and that’s it! Setting up your network is now easier than ever. Thanks to the Software EZ switch on the back of the router, quickly and easily switch between router, repeater and access point (AP) modes. You can also switch modes using the ASUSWRT graphical user interface straight from your browser. No delays and no hassles – whatever your situation, take your pick and get connected.